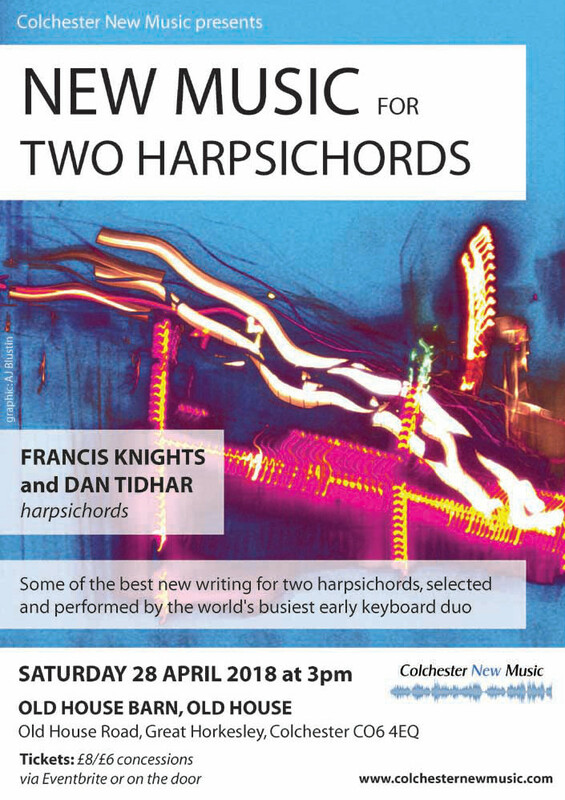 Francis Knights and Dan Tidhar, the world’s busiest early keyboard duo, bring the harpsichord right into the 21st century with an afternoon concert of some of the best in new writing for two harpsichords. They will present works selected from an international competition organised by Colchester New Music, whose aim was to encourage today’s composers to explore the unique personality of the instrument. The winning pieces, ranging in style from lyrical to avant-garde, meditative to dramatic, showcase the harpsichord in all its beautiful, spiky, crystalline quirkiness. The concert will include works by Mark Bellis, Ivan Božicevic, Theresa Chapman, D. Edward Davis, Janet Oates, Randall Snyder, José Jesus de Azevedo Souza, Peter Thorne, Stephen Watkins, Ian Wilson and Rasmus Zwicki. Tickets are now on sale from £6 – £8 and you can book tickets online here. The Knights-Tidhar duo give many performances each year of repertoire ranging from the Renaissance to the present day, on harpsichord, clavichord, spinet, chamber organ and fortepiano. Recent concert venues include the Handel House in London.